To me this is a no brainer. Any tool that is going to make my job easier, sign me up! I’ve run the gamut on these. I started with LESS because I could put less.js on the server and not worry about compiling. Granted, this isn’t ideal, COUGH graceful degradion. 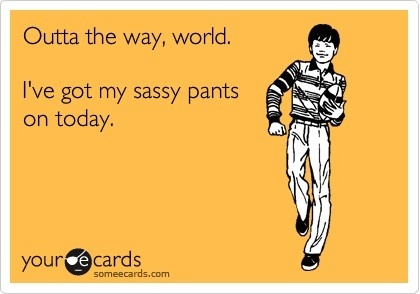 Then, I started looking into SASS. I was curious because it seemed to be more popular and have more features. At the time, I was running an older verison of MacOS that wasn’t supported by CodeKit. So, I turned to LiveReLoad. When I did upgrade, though, CodeKit was one of the first things I installed. I LOVED CodeKit…until I started working on a larger project that took a minute plus to compile. In all fairness, I don’t think it was CodeKit’s fault. It was probably the result of Compass building sprites and RubySASS. Regardless, it forced me to turn to grunt and then finally, to gulp. — And gulp, I shall remain (for now). The good part about this progression is that it allowed me to experiment with a variety of tools. When I’m collaborating with another developer, I’m able to use whatever method they’ve already put into place. I used to rely on Compass for prefixing, but Autoprefixer is awesome. The best part is that it utilizes the most recent data from Can I Use to add only the necessary vendor prefixes. Back in the day, when I used to write long form css by hand, I would list my redefined styles at the top: p, a, hr, you get the idea. Then, layout specific styles, pieces I would use on multiple pages, and finally page specific styles. This made sense from a cascading standpoint. _3_vendor Any third party styles I want to incorporate: fonts, icomoon, etc. _4_redefine Start to lok familiar now? These are the redefined styles that I mentioned earlier. This means all my SASS gets compiled into 1 large CSS file. 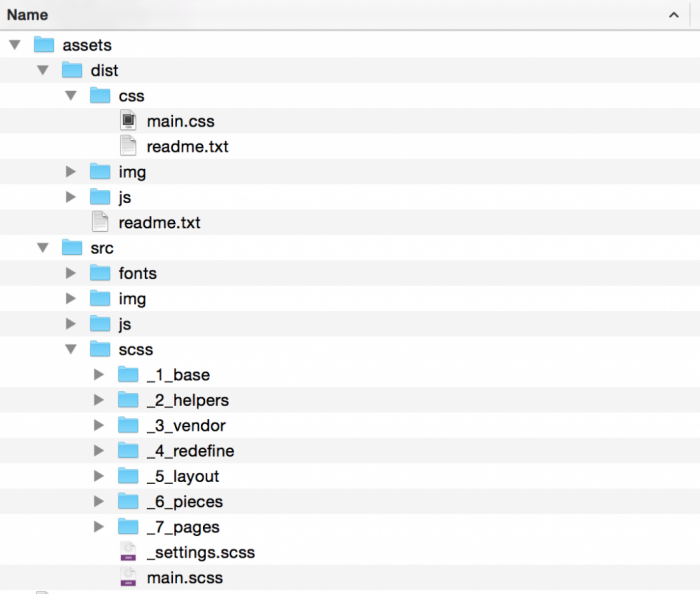 If I do end up having multiple CSS files, it’s to account for IE specific styles. All my partial files are prefixed with an underscore. If you didn’t know, naming CSS stuff is really hard. Plenty of really smart people, people much smarter than me debate about these things. There seems to be two main camps: BEM and SMACCS. BEM stands for block, element, modifier. A lot more alphabet soup to add to the equation! When I started trying to figure out my guidelines, cssguidelin.es became a terrific resource. There’s a section there on BEM-like naming conventions. You don’t want to repeat the DOM in your CSS, but you do want to make it easier to identify. You can also tell from my example that multiple words are not camel cased, but rather have a single dash between each word. When I’m writing classes I know I want to extend, I’ll prepend the class name with a %. There are several advantages here: (1) The class doesn’t actually get written unless it’s used. So, I’ve been able to create a small library of elements that are available to me in all my projects. (2) The % signifies it’s was meant to be extended and is being used in multiple places = don’t change it unless you want it to risk changing multiple elements across the board. I try to use classes instead of IDs. The main reason is because of specificity. You want your code to be as reusable as possible and all your ID elements should be unique. When I’m naming grays, instead of trying to remember the difference between $dark-gray, $darker-gray, and $darkest-gray, I name them by the first letter / number in their hex value: $gray-a, $gray-8, or $gray-c.
All my font names are stored as variables. If you’ve used fonts.com or Google Fonts, you’ll know sometimes it’s hard to remember the exact syntax for a font name. So, storing these values within a variable makes this a no-brainer. Now, if a client wants to change the font, this becomes really easy. Instead of finding and replacing all my $dagny variables, I simply, change the typeface within my %body definition. I know I will be judged here. It’s OK, go ahead pull out your stones. I prefer tabs. I just like seeing the extra space. I have one selector per line. The main reason is that it makes git commits far more meaningful. Plus, it means the display width of my scss file is not very wide. I can keep it in a second pane within Sublime without sacrificing to much of my screen. Most properties have 1 blank line between them. But, if they’re not related, they’ll have 5 blank lines between. I know the alphabetical order thing sounds dumb, but it really does help when you’re skimming for a specific property. I try not to nest. I’m not always great at it, though. SASS just makes it way too easy. The # is supposed to make it easy to find within the project. I’ve finally moved to an SVG spriting system. Let me describe a little bit of the history, here. I originally started with Compass. It worked great, but I was having to create multiple sprite sheets to account for retina, an icon might have multiple versions within one sheet to account for the various sizes, and on larger projects, it’d take a while to render out. Then, I discovered icomoon. It was great because it handled a lot of the problems I found with Compass. I was able to resize icons on the fly, change colors on the fly, and it cut down on my render time. However, every time I wanted to make a change, I had to visit the icomoon site, upload the new icon, download the new files, and replace my existing files. Then, once I got a setup for SVG sprites, all these things magically fell into place. <Insert picture of the unicorn here> Just kidding. Within my src / img / svg folder, I’ll save all my exported svgs. Then, gulp will handle the rest. Awesome! styleguides.io – This is a fantastic resource that compiles style guides and style guide information from all over the inter webs. cssguidelin.es – I know I mentioned it earlier, but seriously, check out this site and take the time to read it. It definitely helped me. How do you structure your style sheets?